You will find the label License Owner in some documents from the Paessler shop. License Owner is the same as License Name for which you may be asked while installing PRTG or when you change your license key. During the setup process, PRTG will ask you to enter your license information. Please use copy&paste to fill out the form in the installer dialog. 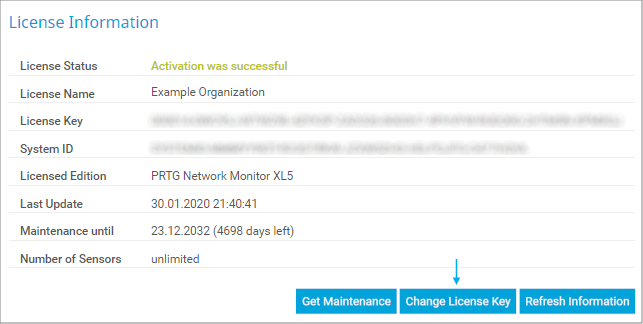 Trial/Freeware license key: When entering a Trial license key, you can experience unlimited functionality of PRTG during the 30-day trial period. Your installation automatically switches to a Freeware Edition afterwards. For details about how to get your free Trial edition, see section Download PRTG. Select Setup | License from the main menu bar.